If you have a Facebook or Twitter account (which almost everyone these days has at least one) then you may have seen statuses and tweets that say YOLO. 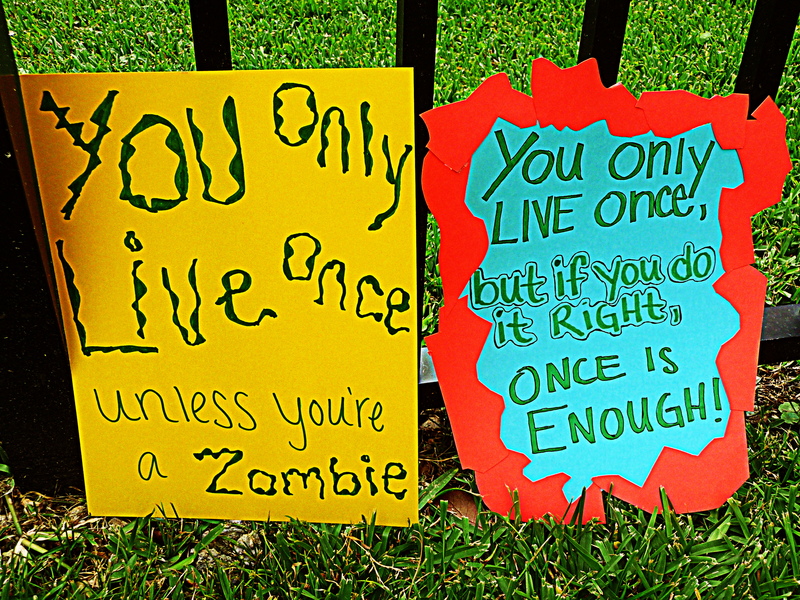 This is an acronym for the phrase “You only live once” which I think became popular with Drake’s 2011 song, the motto. No matter the reason for its popularity, I personally feel the overuse of YOLO has become slightly irritating, especially in the way many people use it. Yes, we all know that we only have one life to live (unless you believe in reincarnation). But it seems that people are using this fact in order to justify the stupid things they do. I can agree that we should live life doing things that make us happy and enjoying each moment we have, but I don’t think acting impulsively is the right way to live life to the fullest. For example, someone might get wasted, do drugs, or put themselves in danger and say that they are doing it because “you only live once.” But to me that doesn’t make sense, it seems backwards. If we only have one life to live, why would we shorten it? Why would we purposely harm the only body we have, make stupid decisions we can never undo, or do anything that would risk damaging the only life we have, when we know we won’t get a second chance? If someone were to give you a car and said you would never be able to have another one no matter what, not even if you bought it on your own, I’m sure you would take care of that car as best as you could. And if you were certain that you could never get another job if you were fired from the one you have now, I bet you would be the best worker there was to ensure your job security. Applying this same logic to physical things in our lives like our cars or jobs, it seems people would most likely try to preserve what they can’t get back once it is lost, but why wouldn’t we feel the same way about our actual life? Our lives should be way more important than our cars and our jobs, I would hope. But I guess that all depends on who you ask. The people that use the phrase “You only live once” as an excuse to live recklessly, could well enough be the same people who don’t take their jobs seriously or anything else in their life for that matter. I’m not saying that people shouldn’t do anything that could potentially harm them in anyway and to live in some bubble, because that would just be ridiculous. But I am saying that we should make smart decisions and stop making excuses for things we probably shouldn’t be doing. If you want to eat an unhealthy cookie, go for it. If you want to live on the edge and go sky diving, go for it. But remember that life isn’t fully about making ourselves happy, but by reaching out to the world and making other people’s lives happy as well. It is important to take risks and do things you may be scared to do, but it is stupid to go overboard with anything. I have no right to tell anyone how to live their life, I just ask that you evaluate your lifestyle and decide if it is one you are proud of. We all can improve at least one aspect in our lives, but we must first be able to acknowledge it before we can change it. So instead of using the phrase “you only live once” as an excuse to make poor, impulsive decisions, use it as a reason to be the best you can be (or at least stop saying yolo after everything!). What does YOLO mean to you?